FOOD RATING Very good. What a wholesome, natural noodle should taste like. Does not contain preservatives, MSG (E621) or any other artificial additives. GREEN RATING Egg and Shrimp/egg flavors: Light Green. Whole Wheat and Vegetarian flavors: Quite Green. Locally made in Hong Kong. No plastic packaging or packets of drying agents to dispose of. The whole wheat noodle is made of organic flour. Unfortunately, the other 3 types are not. The noodles are sold by GroundWorks, a local social enterprise, in a little shop around the corner from Queen’s Cube in Wanchai. Instead of being individually packaged, the noodles are kept in large, traditional glass jars. This means you can avoid creating more rubbish by re-using your own plastic bag or bringing a container to take them home in. I usually re-use a plastic bread bag after shaking the crumbs out. The shop will provide you with paper bags though if you don’t bring your own. The noodles are available in four flavors: egg, shrimp/egg, whole wheat and vegetarian. The egg and shrimp/egg flavors come in both thick and thin widths, while the whole wheat and vegetarian only come in thick. The noodles are great in soup or drained and mixed with a sauce. I like to eat them mixed with a sauce consisting of ketchup, oyster and chili sauce with some sesame oil. At first the noodles may not seem as tasty as the ones you normally eat because they don’t contain any MSG (E621), an ingredient found in almost all other noodles. The absence of MSG though really allows the natural taste of the ingredients to shine through. Of the four flavors, the whole wheat noodle is the most unique because you can actually feel the texture of the wheat. Some may find the texture a bit too coarse though. It’s like eating a noodle version of whole meal wheat bread. Mixing it with another flavor makes for a nice contrast. There are no preservatives or additives. The Liu Tseun factory minimizes the use of alkaline (NOAH) in the production process resulting in a healthier product. 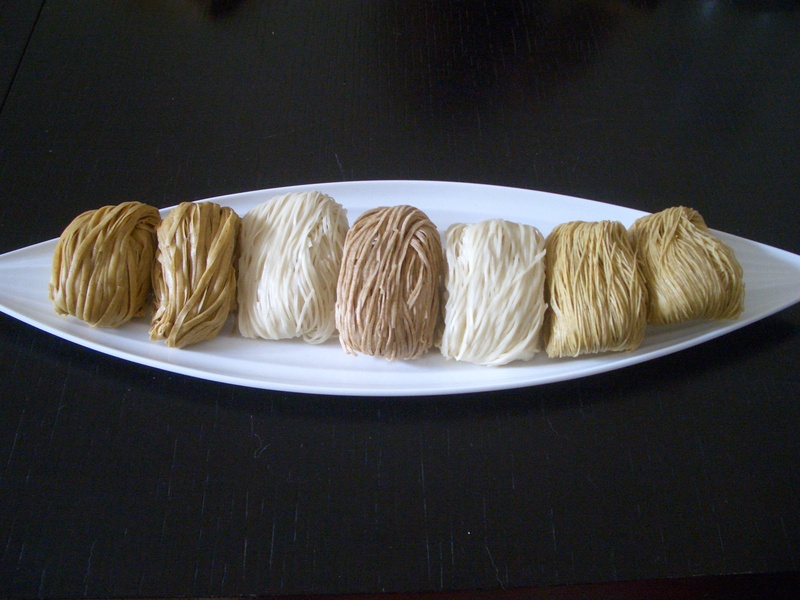 Alkaline is what gives noodles the bouncy, chewy texture and unique color. It also acts as a preservative. However it is not good for the digestive system if too much of it is eaten for prolonged periods. From a consumer perspective, I find the noodles to be both delicious and healthy. Environmentally, the lack of packaging and local production make them light green. Personally, I like supporting social enterprises that are trying to improve the lives of the grassroots, rather than spending my money so that it ends supporting the over-the-top lives of Hong Kong’s famously un-philanthropic tycoons. Park & Shop, Great, Watsons, 3, and Fortress are all owned by Li Ka-Shing. And sometimes it is just about enjoying simple food, like high quality noodles, which can be the most satisfying of all. Bon Appetit!